Sometimes the smallest act of love or kindness from a stranger can make someone’s day. We all need to make more effort to show up in other people’s lives in ways that are supportive and enriching. 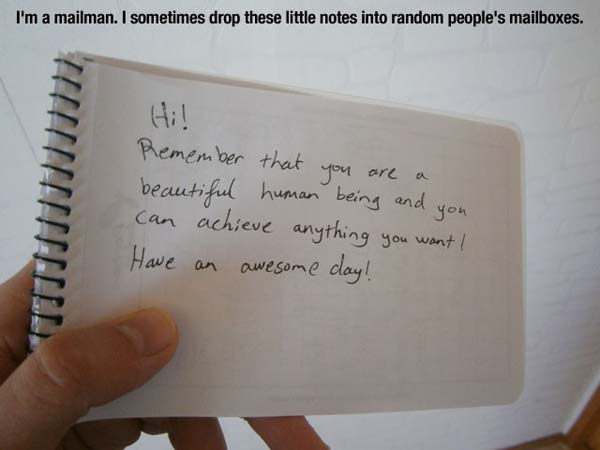 For example, look at this mailman who drops random notes into people’s mailboxes – just ‘cause. Who wouldn’t love receiving a note like this? And just try not to cry when reading these acts of kindness stories. Those of us working in customer support have the potential to impact many people’s days—or even lives—for the better. We are already helping customers, but we also have the power to go above and beyond to bring more love to our work. Oh, and just in case you need to convince your boss that more love is worth it, learn how to measure the ROI of customer love. We all love to hear nice things about ourselves. Make an effort to compliment a customer to make their day. The key is to make it personal and mean what you say. For example, if you work in software, you could compliment them on their use of your product or a memorable account name. Avoid being creepy by not commenting on anyone’s appearance or mentioning anything too invasive! Be as specific as possible for maximum impact. Sometimes one of the kindest things you can do is to let someone else’s error slide. This doesn’t mean allowing another person to make a dangerous mistake, but glossing over something small and insignificant may just allow them to keep their pride intact. No one needs to have their mistakes called attention to, especially if they’re having a bad day. Be tactful and cut them some slack. It means having compassion in what can become a pay-it-forward kind of scenario. Some of the most powerful acts of love are “just because.” They have no target, motive, or goal behind them. Play roulette with kindness by selecting someone you know randomly. Carefully craft them an email telling them how they have influenced you and what you admire about them. For example, you can describe how their values are inspiring. Again, make sure to be as specific as possible, and ideally make it someone you’ve known for a little while. Sending your appreciative email is guaranteed to make their day. Time and time again evidence shows that customers appreciate a handwritten note. Why not also be one of the companies that use snail mail to connect with their customers? Handwritten notes are more personal and take more time to write than an email. They also have a long history—the first letter was written in Persia around 2500 years ago. Send your notes to customers all over the world for added juice. People who send out sales or prospecting emails can send hundreds with no reply. These people are often considered annoying interruptions by their recipients, but they are just trying to do their job like the rest of us. Spread more love by taking the time to reply to one unsolicited email. Even if you’re not interested in the product or service they’re selling, let them know what you like or find interesting about it. Making someone laugh is fun for everyone involved, but it also builds a connection between people, decreases their stress, and boosts their immune system. Even enormously successful and efficient companies like Amazon leave room to be more than a little playful in their customer support interactions. 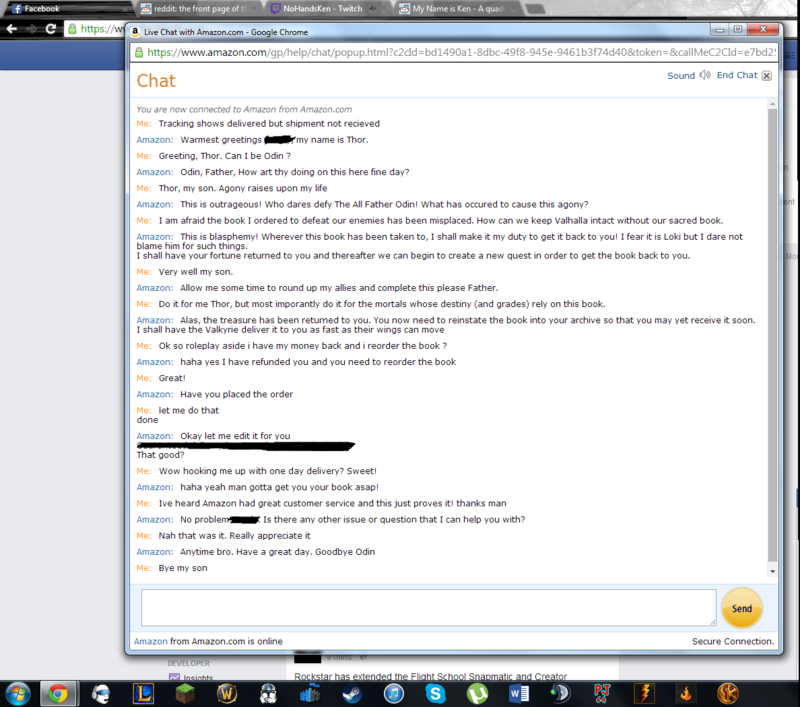 Just take this customer service agent pretending to be Thor, for example. That customer will remember this exchange forever, and certainly tell all of their friends. Humor can be difficult to get right, and not every customer will play along, but when it works you will have comedy gold. Experience will tell you which customers will be receptive. And you never know—you might end up with an unforgettable story that is shared millions of times online. Sometimes customers may mention something important to them that they have coming up, such as their daughter’s birthday party that night or taking their driving test the next day. Follow up with them the next time you talk to them and ask them how it went. Make notes in your calendar if you have to. This takes real effort, and you’ll be surprised at how much it touches people when you remember. Spice up your customer support emails with a relevant and pithy GIF to amuse your recipient. Find GIFs on sites like GIPHY and copy-paste into your email or help desk client. Just take this one of a motorcyclist going out of their way to ensure an elderly gentleman makes it safely across the road. A well-timed GIF can make an otherwise run-of-the-mill email a source of entertainment, and may just brighten someone’s day. “No matter what your cultural sophistication or what language you speak, everyone can understand images,” says Tibor Kalman. Sometimes you may get used to speaking to certain customers on a fairly regular basis, especially if you’re an account manager. If you can, learn your customers’ routines and anticipate them. And if you don’t hear from a frequent flyer for a while, check up on them to show you care. When we learn someone’s routine, this shows that we’re thinking of them when they’re not there. How often does someone contact you without wanting something? Even if they don’t need you that day, they’ll appreciate you remembered. Sometimes in the course of your day chatting with regular customers, they might mention a favorite TV show or comic book. Our favorite shows and books say something about us as a person, demonstrating our interests and revealing our values. Make a point to check out your customer’s recommendation and mention what you thought of it the next time you talk to them. Even if you weren’t the biggest fan, they’ll be delighted that you made an effort. If you get positive feedback from a customer about yourself, the product, or one of your coworkers, take pains to share it with the rest of the team. People feel much happier when they are connected to the results of their labor, even though we all tend to work in specialized areas of the business. Customer support reps are in the best position to gather feedback from customers and share it. Your other team members like the developers or product managers might not get same the chance to hear from your customers. Sharing is caring, and you’ll boost team morale. Even better, cultivating a positive attitude makes you healthier too. It’s easy to get caught up completing tasks in a very monotonous way. Instead, take a little time out to ask someone about how their day is going—and really mean it. Listen carefully to what they say, how they say it, and respond empathetically. Small efforts like these can make for very meaningful interactions, and show someone you care. It turns a routine support interaction into a memorable experience for that customer. Often when we send out customer feedback surveys regularly, we don’t always follow up when customers take time out of their busy schedule to give us their feedback. Reply to survey respondents to show customers you’re listening to them and value their time. Your customers will probably be pleasantly surprised to hear from you! Our survey software Nicereply makes following up on surveys a breeze. Any customer support agent worth their salt knows how to listen well – but listening can also be an active as well as passive process. Using active listening can demonstrate you’re giving your full attention, and avert potentially disastrous consequences by highlighting any biases you bring to the interaction. Feeling heard and understood also gives people meaning and helps them feel more connected with humanity in general. You can demonstrate actively listening to your customers by carefully rephrasing their problems back to them to show your understanding. Use phrases like “Do you mean…” or “It sounds like…” to seek feedback for your interpretations. We all mess up sometimes, and things frequently go wrong in customer service—it’s the nature of the game. When this happens, offering someone a genuine apology goes a long way towards making repairs. Owning up to your own mistakes has a lot more power than pointing out someone else’s, shows we’re humble, and not concerned with simply looking good. “Have no fear of perfection—you’ll never reach it,” as Salvador Dali once said. There are a myriad different ways to show your customers a little love. Each requires time, effort and attention, and will be specific to the customer you are interacting with. Hopefully you’re inspired to show more love in your customer support interactions. Most importantly, make whatever you do about your customer, and not yourself. One of the best ways to connect better with your customers is simply by asking—use Nicereply to send out beautiful customer surveys.